The link below will download the setup file for Version 3. When you have installed it, please check the Help Menu and What's New in Version 3 to find out what's changed since last time. This Setup file will update an older installation or will install a fresh copy. We suggest installing in a folder called SV3. Do not install in the same place as any existing SV32. SpecView’s online Help is here . This is the same as the User Manual, see PDFs here: A4 / Letter sizes. Legacy Version 2.5 download is here. Important note before you download! In V2.5, the Update Subscription was called ‘Free Updates’. If the Update Subscription has expired, then you will not be able to install the software. 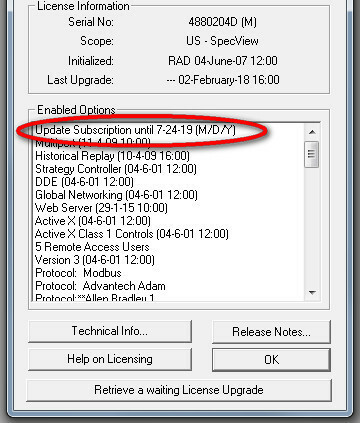 Please contact your SpecView representative or SpecView directly to discuss Update Subscriptions. More help on SpecView Licensing is here. If you are upgrading from V2.5 to V3, then also check that the ‘Version 3’ option is enabled in the License. This is also shown in the screenshot on the right.